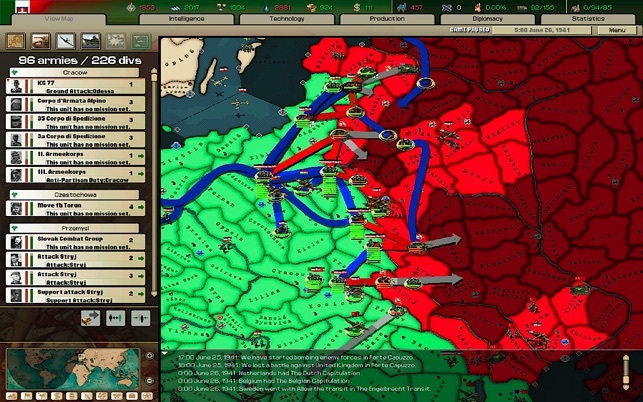 The sequel to the greatest World War II strategy game ever made! Hearts of Iron 2 is a dream come true for every armchair general and forces the player to choose sides when democracy, communism and fascism clash in the battles that changed history. As the German war machine falls, two great nations rise to claim power. In the West, there is the United States, leader of the allied nations, and in the East lies the Soviet Union under communist rule. As both nations attempt to claim superiority, a new war is waiting around the corner; this time, the conflict will decide who will be the remaining superpower. 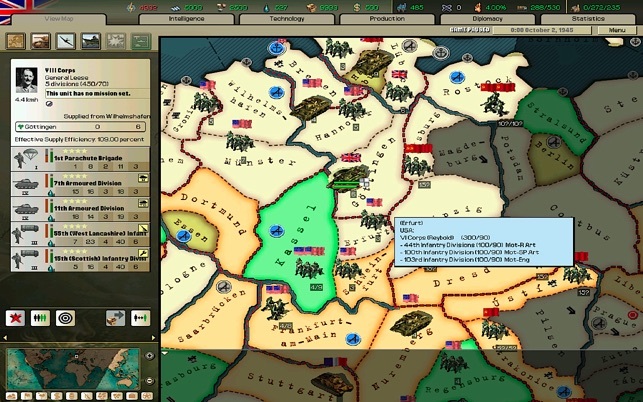 In addition to the four grand campaigns (1936, 1939, 1941 and 1944) of the original game, one extra scenario (1945) has been added. 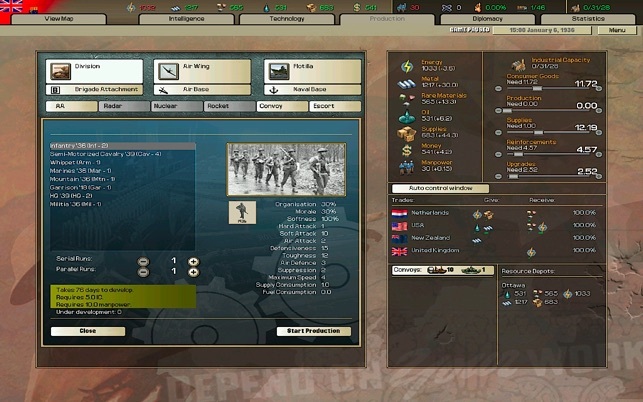 This new “what if” scenario features a continuation war between the United States and the Soviet Union. 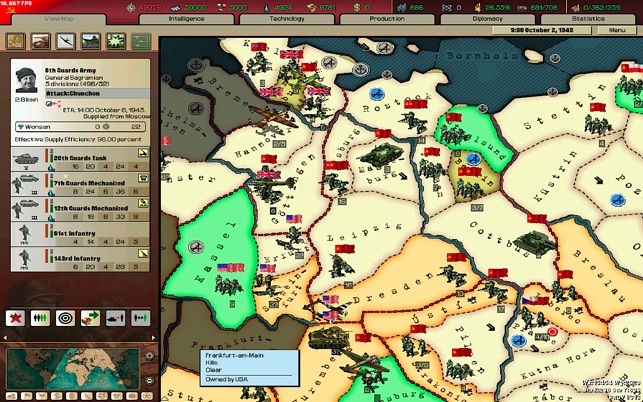 The time limit has also been extended to 1953 and additional warfare and diplomatic options have been included. Spanish Civil War – Franco’s Nationalists contest the power of the elected government that has come under the sway of Marxism. Fall Weiss – Germany invades Poland, marking the beginning of World War II. The Winter War – The Soviet Union declares war on Finland. Fall Gelb – The German invasion of France. DesertFox – The battles of North Africa. Operation Barbarossa – The German invasion of the Soviet Union. Southern Conquest – The Japanese struggle for supremacy in the Pacific. Battle of the Coral Sea – The series of battles around the Solomon Islands. Operation Watchtower – The Americans begin challenging Japanese control of the Pacific and Indochina. Operation Husky – The allied invasion of Italy. D-Day – Stalin has demanded a second front and Italy becomes a diversion. The time has come to liberate France. The Ardennes Offensive – Germany launches its final offensive in the West in an all-or-nothinggamble to drive the Americans back into the sea. 1938 Fall Grün. Czechoslovakia refuses to fold to German demands and war breaks out. 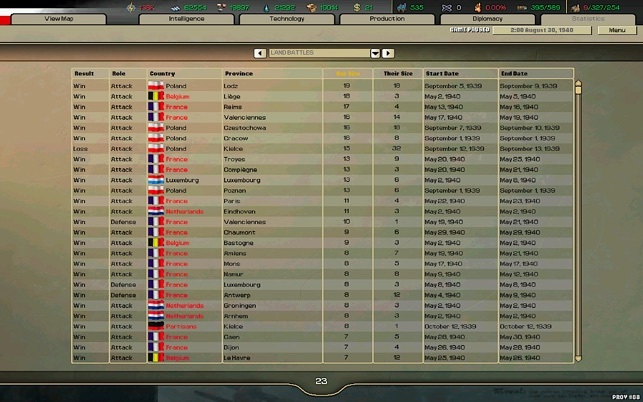 1944 Platinean War. Argentina, as part of the Axis, declares war on Brazil. 1945 Operation Downfall. The US and the Soviet Union advance to conquer Japan without unleashing nuclear weapons. Armageddon includes two completely new alternative history scenarios, perfect for those looking for new challenges! 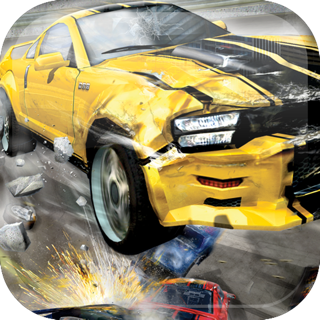 The scenarios will also have variable end dates and in addition to a variety of new game options, gamers will find many new features. Das Spiel selbst ist genauso gut umgesetzt wie früher auf PC unter Windows. Es macht Spaß und ist eines der besten Strategiespielen die ich kenne. Wenn man das Spiel startet läuft es auch erst mal einwandfrei. Ich spiele es auf einem MacBook Air mit der neues OS X Version El Capitan. Nun bin ich mit meinem Spiel im Jahre 1944 angekommen, und der Kriegsschauplatz ist reichlich gefüllt mit Einheiten die an zwei Fronten kämpfen. Jetzt hängt sich das Spiel am 35 Februar 1944 leider immer auf. Ein Neustart zum Anfang des Monats ändert leider nichts am Zustand. Scheinbar hängt sich das Spiel an der Vielzahl von Berechnungen der einzelnen Schlachten einfach auf. Kann also nicht empfehlen sich das Spiel zu kaufen, der Fehler sollte dringend behoben werden. absolut stabil! (Macbook pro mid 2009) läuft wie auf dem PC. Einige ältere Rezensionen berichten von Programmabstürzen. Auch ein im Herbst des Jahres 2015 neu installiertes Programm stürzt in unregelmäßigen Abständen ab. Offensichtlich werden in ein altes Spiel keine Entwicklerkapazitäten gesteckt. Wenn dem so ist, dann nehmt das Programm doch bitte aus dem Shop. Bewußt ein fehlerhaftes Programm anzubieten ist Abzocke.